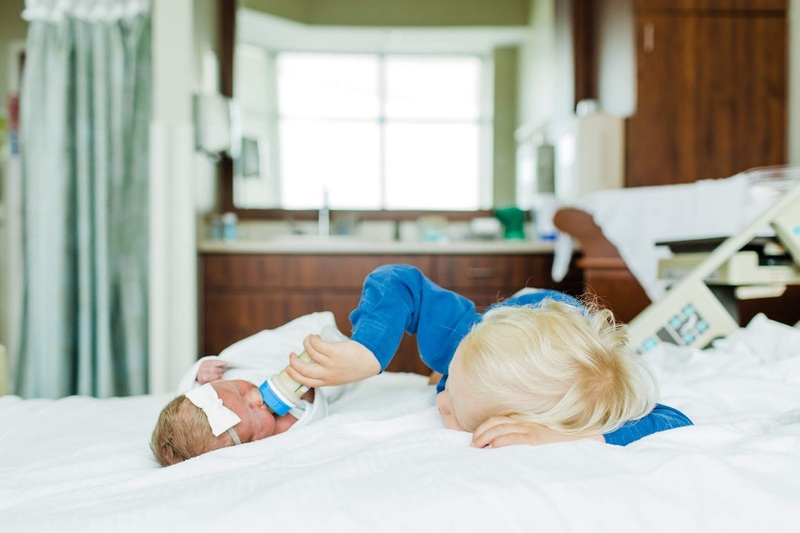 I've thought long and hard about how to write this post, how to really nail down how I felt about the transition from one to two babies - and now that my youngest is one and no longer an infant (and I, ahem, survived the transition), I think I might be ready to lay it all out there. If I'm being honest, my transition from mothering a singleton to a mother of two, aged three and under, wasn't anything like I expected it to be. In fact, it was easier. I know that's a little hard to believe but hang in there with me - and for the record, there are many days that I'm not sure that there is enough of me to go around, but the actual mothering of two babies proved to be less of a dramatic shift than when I became a mom the first time. Why? Oh, I'm so glad you asked. When I had my first baby, I absolutely struggled. But I didn't struggle in the traditional ways - I hated the lack of sleep like everyone else but it was something I could handle, the caring for and nurturing of a baby comes naturally to me and my C Section birth recovery was very easy. I struggled immensely with the loss of myself. The loss of my identity, the loss of my autonomy and the loss of freedom that comes with being a mother took my breath away. I felt suffocated and smothered by the responsibility of caring for and raising a child for the rest of my life. I missed spontaneous get aways and leaving my house without any prep, I missed being someone with passions and goals that were self serving, I missed being able to talk about anything other than my beautiful baby. And I wrestled with those feelings for a very long time. In fact, I never truly adjusted to those "losses" and instead had to proactively search out ways to gain back my identity and independence. I learned that the pressure of responsibility will crush you if you let it, especially if you aren't seeking to take care of yourself and fulfill your own needs. So I did just that, even if the only time I could carve out for myself was after bedtime or during nap. I continued to write and publish the blog, set goals for myself like seeing my work published on respected outlets and gave myself a break on the days when my brain was just too tired to form coherent sentences. I fell in love with renovating and designing our homes and working with my husband to create dream spaces for our family. Eventually, I recognized myself as something other than Gray's mom and felt like I could breathe again. I settled into life as a a full time, stay at home mom who also worked on the side doing things that inspired me and reminded me of my own talents and skills. By the time we welcomed Georgia into the world, I was prepared to handle the weight of being her mother. I knew that the outlets I had built for myself would wait for me and would be ready for me when I needed a reminder of who I was outside of diapers and formula. It's been well documented that Georgia's first six months were nothing less than excruciating and her entire first year was completely different than I ever dreamed. Needless to say, I struggled in the day to day of managing life with a three year old and difficult baby but that, for me, was a phase to get through. A terrible, exhausting phase that I wouldn't wish on anyone, but the feelings were very different than what I felt when I first became a mom. In that way, having a second baby was actually easier than when I had my first. Do we have more stuff, more laundry to clean, is it harder to get out of the house? Yes, of course. Are there days where I wonder if I'll survive until my husband makes it home or that I'll lose it if I hear "MOM!" one more time? Um, weekly. But do I worry that I can't love them both equally or that they aren't cherished or their individual talents aren't appreciated? Not in the least. The motherhood experience is nothing short of a mind game that I'm not sure many have mastered. We all struggle, succeed and strive to do better in different areas, which makes our stories all so different but ultimately tied together by wanting to do the absolute best for our babies. My struggles were much different than I imagined but how can anyone prepare for the weight of motherhood? Tell me, what was your hardest transition? Being a first time mom or welcoming additional babes to your tribe? Yes, yes, so much yes. I could have written this post! Transition from 0 to 1 was my most difficult, for sure. I wanted to be a mom my entire life -- it's my biggest dream, and it's realized, and I am so very grateful every day -- but I refer to it as a sort of "grieving" for your "old life" after you have that first baby. And nobody really talks about it. I remember crying to my husband "But I just want to go to the movies!" It's that realization that your entire world has shifted. And as you said, over time it falls into place, but that first transition is very real. The transition from 0 to 1 was soooo much harder than from 1 to 2 for me, too. Still working on finding myself in all this!!! This was so beautiful to read, and always so interesting read other peoples experiences with the transition. Absolutely. I just wrote in a shower card for a second time mom that having my first made me a mom, but having my second settled motherhood on my heart in a better way. I have less time, but manage to bring more of me to the time I create and the roles I play. I loved this post. I'm only a mother to one and working on two, but I so relate to feeling the loss of myself as a person. It's such a struggle. The first year was so hard and overwhelming. I wish I had continued to blog or seek out ways to define myself but it's a work in progress, I suppose. He's 2.5 now and I'm more settled with being a mom, but I loved and related to this so much, so thank you for putting it out there. I love this!!!! There have been times I have struggled and felt bad for those thoughts! I love being a mom more than anything in the world!!! I could not agree with this more. With our second baby, I was more confident with the infant phase and knew what to expect. 0 to 1 was the hardest for me also! I'm so glad that I'm out of that stage, 1 to 2 has been much more enjoyable. Love this post! The transition from 2-3 kids (3 kids in 37 months) put me on the #strugglebus. I barely survived and wouldn't wish it on anyone. We didn't have family nearby so it was my husband and I by ourselves.